Followership is as Important as Leadership! Do a Google search for the word followership and you get 142,000 results; do a search for leadership and you get 134 million. Yet without followers, a leader is a lonely figure. So why do we focus so much attention on leadership and so little on followership? The day when a leader could expect blind allegiance is gone. More and more people are challenging hierarchal structures and those at the head of them. There is a dynamic relationship of mutual benefit and support between the leader and the follower. They both need each other, and the task, organisation, business or cause that they serve needs them both. Moreover, it needs them to work together. Therefore, it is in the interest of your business or organisation to give attention to both, and to the dynamic of the relationship between them. It is necessary to distinguish between followers and subordinates. Subordinates are in an inferior position in a hierarchy and are expected to obey commands from the person in the position of leader. The leader has authority and the subordinate is expected to submit to that authority. A follower, on the other hand, follows because they want to. There may still be a hierarchal structure in place, but they follow because they want to and not because they have to. It cannot be assumed that people will follow a leader. The follower has needs that must be satisfied by the leader or they will cease to follow. When they do so they become a leader – either leading themselves and others away from the organisation or leading the organisation in another direction. I believe that organisations or businesses that take an honest and open look at this dynamic and focus on how to support both leaders and followers have the greatest chance of success. Alienated Followers are independent, critical thinkers; but low on active engagement. Although members of the group they do not participate, are critical and cynical. They are free thinkers. Conformist Followers (Yes People) are actively engaged but are not independent thinkers. They like to be told what to do and will defer to the leader. Passive Followers (Sheep) are dependent upon the leader to do the thinking, are uncritical of the leader or the group’s actions and are passive participants, going along with the group. Pragmatist Followers (Survivors) somewhat independent in their thinking and active engagement. They are measured and limited in their criticism of the leader. Exemplary Followersare independent critical thinkers who engage actively in the group. They can be relied upon to give constructive, critical input and to act on their own initiative. The Partner is highly supportive of the leader yet will also challenge and question the leader’s behaviour and policies. Chaleff identifies this follower as displaying the characteristics of a Courageous Follower. The Implementer can be relied upon to get the job done without much supervision. However, they cannot be relied upon to give critical feedback if the leader is heading in a direction that conflicts with the purpose or values of the organisation. The Individualist can be relied upon to voice an opinion and be critical of the leader. However, they tend not to balance their negative criticism with active support when the leader is doing well. The Resource is reliable and dependable – a safe pair of hands. They can be relied upon to do their job but no more. They are unlikely to voice an opinion one way or another. In an ideal situation the leader will have plenty of Kelley’s Exemplary Followers or Chaleff’s Courageous Followers. However, this will not happen without leaders and an organisational culture that supports this relationship. It requires a leader who is not afraid of criticism, who is open to and who cultivates relationship, and who is prepared to follow. It requires followers who are able to see that their current role is to follow, and to show leadership. It requires an organisation that sees these roles; leader and follower; not as rigid positions but as roles that support the purpose of the organisation. The concept of roles as being fluid and not attached to individuals is an important one to grasp. It is core to how Process Work views relationships. It is not to say that there should not be a position of leader. However, if the role of leader is seen as fluid and belonging to the group then it is open to anyone to take it up. Similarly, the role of follower is fluid too and can be taken up by anyone – including the leader. If the roles of leader and follower are seen as belonging to the group rather than being attached to any individual it is possible to get away from any one person being permanently attached to a particular role. In that way it is the group’s purpose that can be followed and led. To do this there needs to be an open and frank dialogue between all members of the organisation about what is expected of the leaders and the followers. This will allow a relationship where all understand and support the various roles and everyone is in support of the purpose of the organisation or group. It may sound absurd but it is true. There is no leader who is not a follower somewhere else. Of course that leader must have been a follower sometime so, why do we have millions of write ups on leader and how one can maximize followers. why try to utilize followers if not because of the importance thereof. 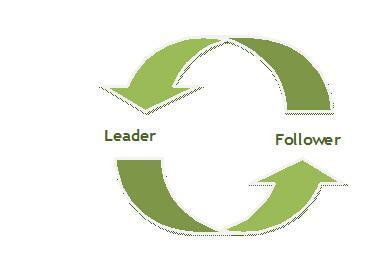 The concept of followership should be given its priority for no leader can exist or succeed without the inputs from the led.I am impressed and encouraged by your projections to continue in my research on Followership.